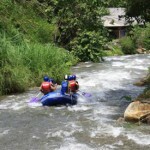 White Water Rafting Thailand trips are a wet and wild adventure for the whole family. Easy Day Thailand offers daily tours from Phuket Island, Khao Lak Beach and Krabi to Tonepariwat river in Phang Nga Province. An elephant trek to a waterfall with the chance to take a swim in the pool. Visit to Suwan Kuha Temple (monkey cave). Included in our prices are usually transfers from most Phuket hotels (please check with us as some hotels require a small surcharge), lunch, seasonal Thai fruits, drinking water, helmets and life jackets, national park entrance fee. 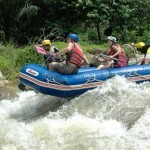 Rafting Tours from Khao Lak are as the trips from Phuket as well great value for money. The Tours also do the rafting at Tonepariwat river in Phang Nga and offer the same activities and Add-Ons as the tours from Phuket Island. 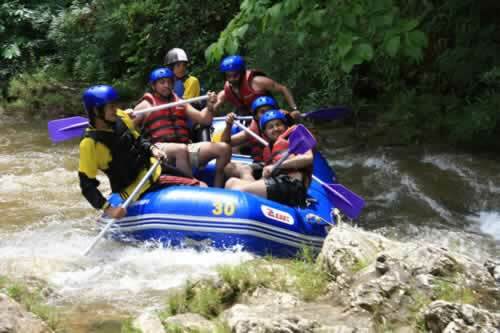 Best Time for Rafting is the Summer season when rain is increasing the level of water in the river. However too much rain can lead to trip cancellations due to “Too much” water. Rafting from Krabi & Ao Nang is possible all year around and the rafting takes place smaes as from Phuket & Khao Lak also at Tonepariwat river in Phang Nga Province. 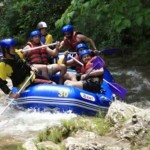 Here you have a wide variety of Add-Ons available to customize your White Water rafting day in Thailand. Add some ATV riding or add more rafting (only for adults). Contact us now for information about rafting in Thailand. We get back to you shortly with options.